It's that time of year...Graduation....My oldest will be graduating from 8th grade, and we also have numerous other family graduating this summer - so I was in need of something that I could mass produce. 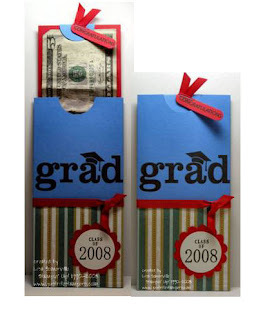 These money holders are easy to create and personalize. I used the above template I created to make this simple money holder. 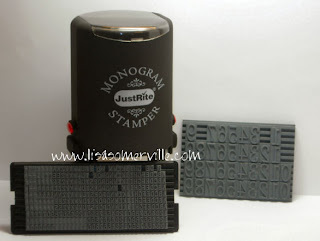 The "Class of 2008" was easy to create, using my Just Rite Stamp DIY Monogram Stampers - these are great for personalizing your projects as well. Here's a view of the inside - On the top of the insert (6-1/8" x 2-7/8") - I've attached a 1-1/4" circle folded in half - I stamped my sentiment from Great Grads in black, punched it out with my word window punch, added a piece of red grosgrain, and stapled these items as shown. Be careful not to staple too far down - as this is what will hold your money at the top. At the bottom, I used my Slit Punch to create an opening that will keep my money in place when inserting it into the holder. Great gift idea, Lisa!!! Gotta love that Monogrammer -- so glad Flourishes is carrying them!!! TFS this great project!!! 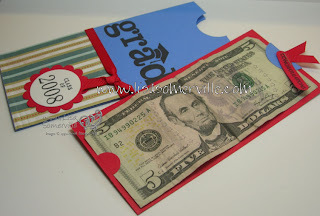 I found you through tip junkie, and love this gift idea! I will definitely be using it for some upcoming presents! VERY cool gift card holder, Lisa! I was posting a gift holder tonight and ran across yours--love it! I like this - clever stuff! Thanks for sharing... and that slit punch is a fab little gadget! Thanks for the great idea! I am going to have to get the punches and stamps you use! I posted the one I made, with a link to your site on my blog today! Thanks!